Mango Malpua is one of the traditional Indian recipes, innovated with mango. 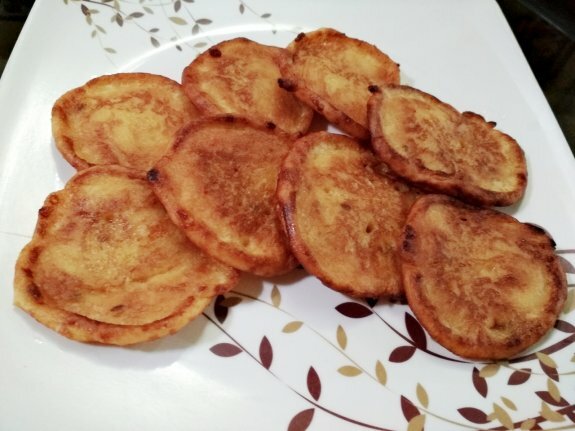 Malpua with yummy flavour of mango make this recipe as one of the delicious one in the season of mango. Mango Malpua is a popular aromatic dish during mango season. Mango Malpua would definitely enjoyed by everyone. You can serve this on any special occasion, party and festivals in your home. 1. Take a big bowl and add flour, semolina, roasted fennel seeds, salt and sugar. Mix everything well. 2. Now, add milk and mix properly so that no lumps could form. Mix with hand whisk. You should check the consistency of the batter. The batter will resemble like Idli batter. 3. Now, take a frying pan and add 1 -2 Tbs of oil. Heat on a medium flame and pour 2 Tbsp of Malpua batter. After cooking of one side, flip the other side to fry. Remember fry the malpua until light brown in colour. Don’t overcook or over fry the malpuas, otherwise it would become stiff. 4. Remove from heat and serve it in a plate. Garnish it with some fresh chopped mangoes. If you want, you can pour some mango puree on top of the malpuas to get more mango flavoured taste in it.